Food Wishes Video Recipes: Happy Birthday Valerie! One thing I am VERY careful about when it comes to authoring this blog is preventing it from becoming a “blog.” When I go to read another blog about wine pairing or Thai food, that’s what I want to read about, I don’t want to read about the blog author’s ear infection, or that their cousin just got back from Nova Scotia and wants to share some photos. So, I’ve kept this blog 99.5% about food, with the one exception of wishing my Mom and now my sister Val, a happy birthday. She is a police officer in western New York State, and I should add, a great cook in her own right! I love her famous Chicken Kiev, which is why it’s pictured at the beginning of the post. 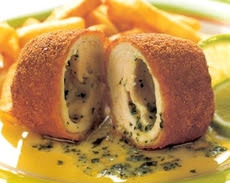 So, you thought you were going to see a Chicken Kiev video…psyche! Although, the next time I’m in NY, I will be sure to film her making this delicious, garlic butter-soaked recipe. Since I ripped Paul McCartney’s cooking skills yesterday I thought I would show him doing something he’s good at. Here’s a video of Paul singing Happy Birthday to my sister. Psyche is right! You got me...I want chicken kiev now. Oh, well, Happy Bday to your Sis. how cruel! that looks wonderful. how long must we wait? If I read correctly above, the chicken kiev video was supposed to come october 30th, right? 2007? And when was the wedding Val was talking about? Pleeaase lets have chicken kiev!! Pleeeeaaase!!! four and a half years later......wheres the kiev? ?